When you find your relationship getting stuck in a rut, surprise your spouse with a new you...well, three new yous! You're both sure to get a laugh out of this dinner date based on TV's "The Dating Game" where a bachelorette would question three bachelors who were hidden from her view. At the end of the questioning period, she would choose one to go out on a date with. To create a little anticipation, you can either give a card like the one below to your spouse or email it to them at work or school as a hint that Date Night is going to be fun tonight! You can download my free invite by clicking the links below. Cultural Food: Italian, Chinese, Indian, etc. Bachelorette #1 (Cowgirl): "I'd take me and my cowboy to the rodeo. Yee-haw!" Bachelorette #2 (Teacher): "Prom! I'm chaperoning, but that doesn't mean I can't dance!" Bachelorette #3 (Barbie): "Umm...I'd, like, go shopping or like, get pedicures together." If we were marooned on a desert island, what would be the first thing you'd do and why? If you could go on a vacation anywhere in the world, where would you go? Your house is on fire, what do you grab as you run out? What color best describes your personality and why? What do you wish you could change about yourself ? You are driving and get lost, what do you do and how do you handle it? If you were going to be famous for one thing, what would it be? 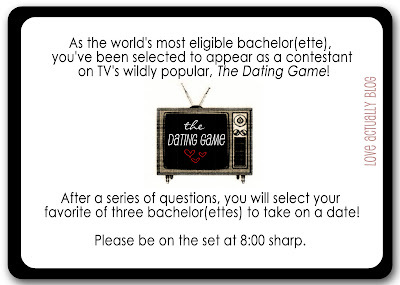 You can Google "dating game questions" for ideas on more creative questions. Well, what are you waiting for? Let's get this show on the road! This sounds really fun! Great idea. I love your ideas and check your blog pretty much everyday! Keep 'em coming! Thanks! My pleasure to come across your blog and read it, keep posting. Searching for the Best Dating Site? Create an account and find your perfect match.